Huge Savings Item! Save 13% on the Cascade ActionPacs, Fresh Scent, 22. 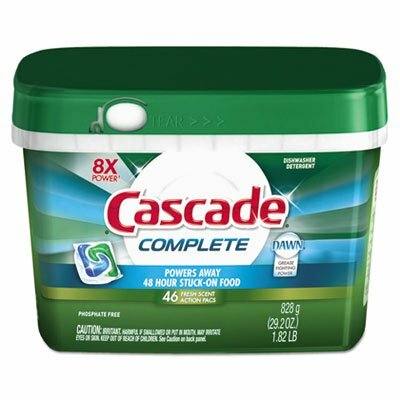 5 oz Tub, 43/Tub, 6 Tubs/Carton by Cascade at Blog Free Here. MPN: 98208. Hurry! Limited time offer. Offer valid only while supplies last. Cascade powder and dawn liquid dishwashing soapsbined into one convenient pac. Scrub dishes clean while cutting grease. Easy to load without a mess. Cascade powder and dawn liquid dishwashing soapsbined into one convenient pac. Scrub dishes clean while cutting grease. Easy to load without a mess. Needs no pre-wash. Application: automatic dishwasher detergent; applicable material: ceramics; enamel; fiberglass; glass; metal; plastic; chemical compound: sodium carbonate; sodium silicate; enzymes; phosphate free; dirt types: cooked-on grease; food particles; oils; organic matter; soil.